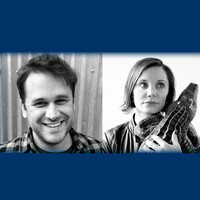 Authors Dean Bakopoulos and Alissa Nutting will read from their works as part of the Allegheny College Single Voice Reading Series on Thursday, February 21, at 7 p.m. in the Tillotson Room of the Tippie Alumni Center. The event is free and open to the public. Dean Bakopoulos’ first novel, “Please Don’t Come Back from the Moon,” was a New York Times Notable Book; he co-wrote and co-produced the film adaptation, which debuted at the 2017 Los Angeles Film Festival. His second novel, “My American Unhappiness,” was named one of the year’s best novels by The Chicago Tribune, and his third novel, “Summerlong,” was an independent bookstore bestseller and is now in development as a feature film based on Bakopoulos’ screenplay. The winner of a Guggenheim Fellowship, as well as NEA fellowships in both fiction (2006) and creative nonfiction (2016), Bakopoulos is writer-in-residence at Grinnell College and he teaches in the Warren Wilson MFA Program. He is also co-writing the television adaptation of Alissa Nutting’s novel, “Made for Love,” for Paramount Studios. Alissa Nutting is the author of the novels “Made for Love,” a New York Times editor’s choice selection, and “Tampa,” the film version of which is in development with director Harmony Korine, as well as the story collection “Unclean Jobs for Women and Girls,” an expanded/revised version of which is being rereleased in Summer 2018 as part of Ecco’s “Art of the Story” series. A collection of her comedic essays is forthcoming from Ecco in 2019. She is currently at work on two television projects — one animated in development with Cartoon Network, the other based on her recent novel and being co-written with Dean Bakopoulos for Paramount Studios. She is an assistant professor of English and writer-in-residence at Grinnell College. For more information about the Single Voice Reading Series, contact Frederick F. Seely Professor of English Christopher Bakken at cbakken@allegheny.edu.